Tax rates matter. This should be a simple economic truth, but unfortunately, the argument for why tax rates matter often does not register. They matter because the more you tax something, the less of it you will get. In addition, for every dollar the government takes away in taxes that is one less dollar that is available to be used in the economy. It is also forgotten that the more taxes a government takes it is confiscating an individual’s property that was earned through hard work. The corporate income tax rate does impact economic growth and entrepreneurship. The Federal Reserve study found that “increases in corporate tax rates have a statistically and economically negative effect on employment among startup firms.” Iowa also understands the impact of sharing a border with a state that does not have an income tax, South Dakota. In the past ten years South Dakota has seen 75 percent job growth compared to 5 percent in Iowa. Regarding new health care facilities, South Dakota had 95 compared to only 8 new health care facilities in Iowa. The Kauffman Foundation provides a rating regarding the growth rate of new entrepreneurs and found that South Dakota outperforms Iowa. 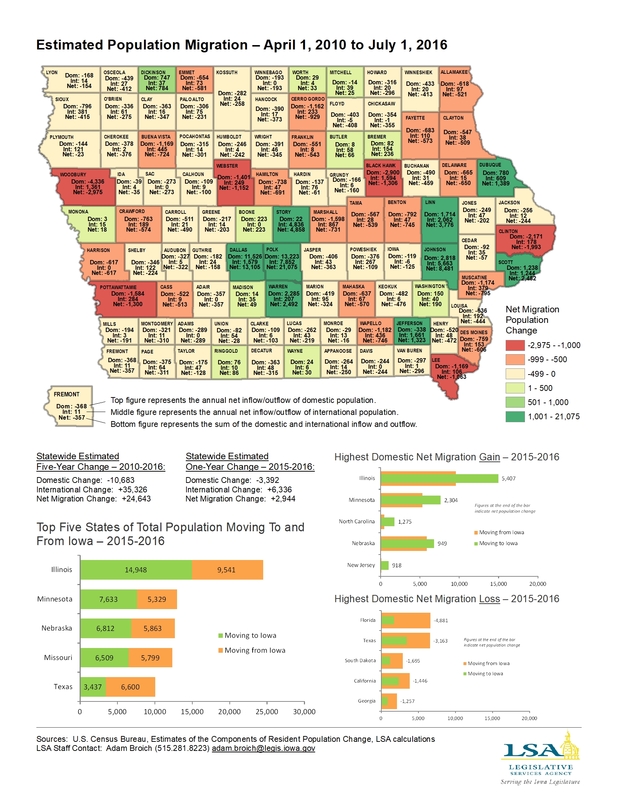 The Kauffman Foundation measured that out of every 100,000 adults Iowa only sees 200 new entrepreneurs, while South Dakota has 310 new entrepreneurs. This is reflective of the Tax Foundation, which ranks Iowa the 10th worst state for its overall business climate, while South Dakota is ranked third for best business climate. Tax rates not only impact entrepreneurs, but population. States that have lower tax rates tended to see more in-migration. The Cato Institute measured the impact of tax reform and population and in the Midwest South Dakota “has enjoyed net in-migration in four of the past nine years,” while surrounding states, including Iowa, experienced net out-migration. In fact in 2015-2016 Iowa lost over 9,000 people to Florida, Texas, and South Dakota — all states that do not have an income tax. This demonstrates that tax rates matter, and individuals, entrepreneurs, and businesses will vote with their feet to find states that have a low tax and regulatory climate. Economic growth occurs when we increase the quantity and/or quality of labor and capital. Taxes increase the cost of whatever is being taxed, and people respond by doing less of whatever is being taxed. To get more prosperity, lower tax rates on productive behaviors such as work, saving, investment, and entrepreneurship. Tax rates do matter. If Iowa wants to keep and attract more people, provide a friendlier business climate, and provide more economic opportunity and freedom the legislature must continue to work towards lower tax rates. Iowa Senate Republican Leader Bill Dix (R-Shell Rock) announced the Senate Majority Fund team who will work to build a GOP majority in the Iowa Senate.